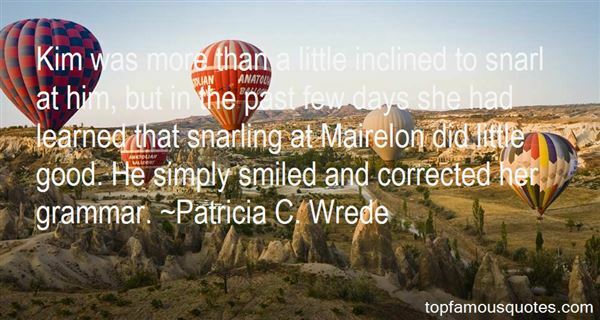 Reading and share top 13 famous quotes and sayings about Mairelon by famous authors and people. 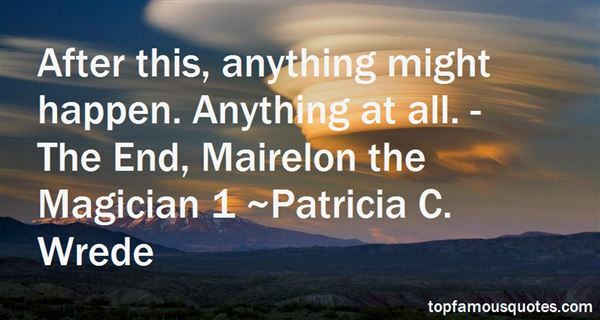 Browse top 13 famous quotes and sayings about Mairelon by most favorite authors. 1. "Kim lifted the lid. Inside, on a small pillow covered in white velvet, lay a gold sunburst the size of her thunbnail, hung on a delicate chain. It looked a little like the first spell she had ever cast, a small explosion of light re-created in metal, and she was not really surprised to find the card with the single word "Mairelon" scraled across it." 2. "And on top of everything, Mairelon hadn't even said she looked nice." 3. "After this, anything might happen. Anything at all. - The End, Mairelon the Magician 1"
4. "Allowing anyone, even Mairelon, not only to come close to her, but to circle her waist with his arms brought back old fears, though she had to admit that the sensation was pleasurable on those rare occasions when she could relax enough to enjoy it." 5. "The Marquis of Harsfield Lord Franton, arrived after you left." Lady Endall said with some satisfaction. "He said he wished to be presented to Kim, and was quite dissapointed to find she was not there.""Harsfield? He must be nearly eighty." Mairelon said, frowning. "What does he want with Kim? ""No, no, Richard, you're thinking of the fourth Marquis of Harsfield," Lady Wendall said. "He died last year; it is the fifth Marquis who was asking after Kim. He is quite a young gentleman--not much above twenty, I think. He was the grandson of the previous marquis.""Oh. I expect that's all right, then." Mairelon said, but he continued to frown." 6. "If a beauty like Letitia Tarnower couldn't interest Mairelon, and a brilliant wizard like Renee D'Auber hadn't attracted him in all the years they'd known one another, what chance did she, Kim, have?" 7. "Well?' Jasper said when Mairelon did not reply. 'Who are you? ''No, no,' Mairelon said. 'I asked you first. I also, if you recall, asked how you found this place and what you intend to do here, and you haven't told me that, either. ''We might ask you the same thing,' Jasper retorted. 'You might, but I don't recommend it,' Mairelon said. 'You'll get a reputation as a poor conversationalist if you all can do is repeat what other people say to you." 8. "Thank God!" he said, and kissed her.Kissing Mairelon was much nicer than anything she had ever dared to imagine, despite the headache." 9. "Kim was more than a little inclined to snarl at him, but in the past few days she had learned that snarling at Mairelon did little good. He simply smiled and corrected her grammar." 10. "I most certainly can deny it. Of course, if I did, I'd be lying." Mairelon"
11. "You mean he thinks I'm going to get MORE offers?" Kim said, appalled. "He doesn't seem to be the only one that thinks so." Mairelon said. "Aunt Agatha mentioned it to me yesterday afternoon. Is there anyone, or would you rather I turn the lot of them away? "Kim shook her head. "There isn't anyone. "Except you." 12. "Come one, come all! Prepare to be amazed by the one, the only - Mairelon the Magician!" 13. "Your levity is unbecoming, Richard, and not at all the point,' Mrs Lowe said, giving him a stern look. 'In another week, the Season will be upon us, and as you have chosen to come to Town for once, I shall expect you to find a little more time for your social and family obligations. ''Oh, you may expect whatever you like, Aunt.' Mairelon's tone was careless, but there was a set to his shoulders that told Kim he was not pleased. 'People are already arriving, and I fear there are quite a few who are...confused about your proper standing''I can't imagine why. 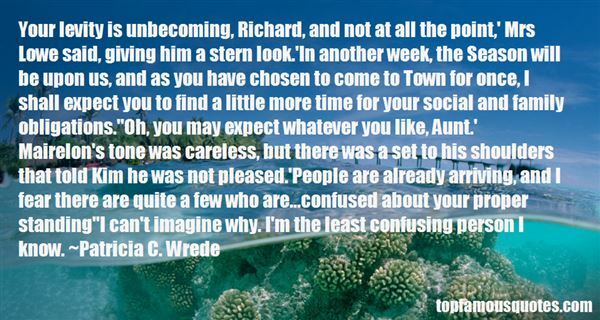 I'm the least confusing person I know." We inherited these principles and these freedoms and we here highly resolve that we shall pass them on, as we will pass on an undivided Republic purged of racism and slavery, to our descendants. The popgun discharges of a few pathetic sectarians and crackpot revisionists are negligible, and will be drowned by the mounting chorus that demands: 'Mr Jefferson! BUILD UP THAT WALL'."